Bring your customers back for repeat business! 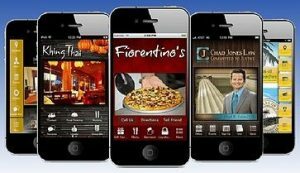 Mobile Apps offer small businesses an inexpensive tool to compete with larger competitors and national chains. For a small, fixed monthly marketing budget item, you’ll see results and your customers will feel more connected to you. Salons & fitness centers can allow appointment scheduling and display photo gallery. Non-profits and associations can list events and make donations easy. Real Estate Agents can offer one tap access to property listings and send timely push notifications. DJ’s and entertainers can show lists of events, newsletter opt-ins & photo galleries. Each feature has a number of options. For example, a pizza shop can include delivery, pick up or dine in or any combination of those. They can accept credit card payment via the app, accept cash, or either one. Either a custom ordering system or an existing third party platform such as grubHub, olo, yelpEat24 or iMenu360. A custom delivery radius can be set up around your location so that people out of your area will only have pick-up option. Delivery charges, optional tips and other conveniences are included to make it easy for people to place orders. Once they’ve ordered once, the likelihood of repeat business increases dramatically. Show your customers all of the features and tell them to watch for app-only specials! Send periodic push notifications with value, such as discounted meals or services or menu items. 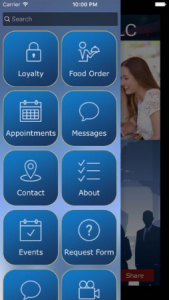 The loyalty rewards feature allows several different promotions to run simultaneously so there is something for everyone. For example, a pizza shop could give rewards per slice of pizza or per pizza or both. The “open-rate” for push notifications is astronomical compared to that of regular email messages or newsletters. You can even target different geographical areas or pre-schedule them to send at a later day or time. This entry was posted in General, Internet Marketing and tagged delaware business, mobile apps, smartphone apps on February 2, 2017 by recast.